From fresh-carved turkey to mashed potatoes to pumpkin pie, Thanksgiving is all about gathering with friends and family over an amazing meal. But let&apos;s be honest: cooking all that food is a big job. And holidays are really meant for relaxing. This year, take off to York County, PA, and let someone else worry about the turkey. Here are just a few restaurants offering up a dinner with all the fixings. Celebrate with friends a few days early at Tutoni&apos;s Friendsgiving Dinner, running 6:30-9 p.m. on Tuesday, November 22. This farm-to-table hotspot in Downtown York is putting an Italian twist on the holiday meal. Tutoni&apos;s plans to serve up sweet potato gnocchi or roasted porchetta, all of it served family-style. The dinner costs $35 per person, with an option to add unlimited wine and beer for $25. After your stomach settles, explore the rest of Downtown York, where you&apos;ll be thankful to find craft breweries such as Mudhook Brewing Company and Collusion Tap Works or the popular White Rose Bar and Grill. Don&apos;t lift a finger on Thanksgiving Day. Instead, let The Accomac handle dinner as you gather with friends and family at the restaurant along the Susquehanna River. This casually upscale restaurant offers inspired takes on holiday favorites, with a free-range turkey dinner topping the list of seven possible entrees. Fill up with three mouth-watering courses, including dessert of pumpkin pie, sticky toffee pudding or a roasted local apple and more. Main dishes range from $24 to $30. Make sure to call ahead for reservations. There&apos;s no need to wait for dinner to enjoy your turkey. Watch the Macy&apos;s Thanksgiving Day Parade then scoot right to brunch at the Heritage Hills Golf Resort & Conference Center. An herb-and-citrus roasted turkey breast will star at the carving station, and you can pile your plate high with fixings like mashed potatoes, sweet potatoes and a brioche stuffing. Plus, pumpkin, apple and bourbon pecan pies await for dessert. Of course, if you want to save the turkey for later, there are plenty of breakfast offerings. Enjoy an omelet station, pancake station and more. The brunch runs 11 a.m.-5 p.m. Thanksgiving Day. Limited seating is available, so make your reservation today. Adults are $32.95, children 6-11 $15.95 and children 3-5 $6.95. Children under 2 dine free. Uncork some holiday spirit at Naylor Wine Cellars&apos; Holiday Wine Dinner on November 19. Homemade food is paired with award-winning wine from York County&apos;s oldest winery. Each course features a different selection of wine, plus all guests receive a souvenir wine glass and discount on wine purchases. The dinner also falls on the final day of the Wine Just Off The Vine signature event on the Mason-Dixon Wine Trail, meaning you can cap your day with a great meal after spending the day exploring all the other wineries in and around York County. It&apos;s a great way to celebrate the holidays a little early. Dinner is $49 per person. Another one of York County&apos;s fine farm-to-table restaurants, the John Wright Restaurant, will do all the Thanksgiving cooking for you. All you need to do is pick it up on Wednesday, November 23. Takeout turkey dinners for four or eight people are available at John Wright, with carved turkey and all the trimmings available. 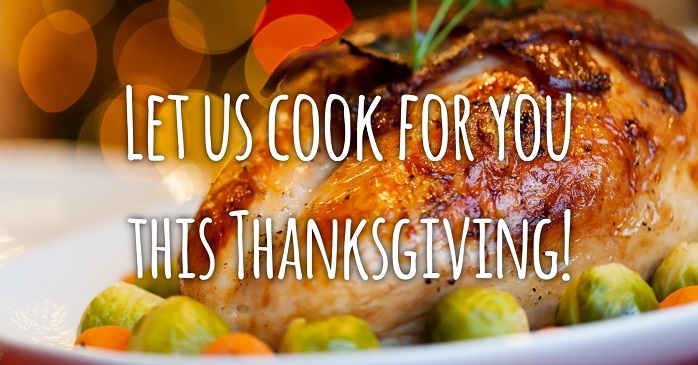 With almost two pounds of food per person, nobody is going to go hungry on Thanksgiving Day.